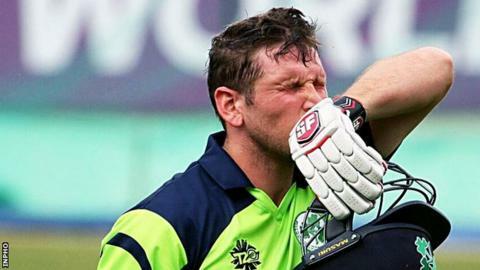 Ireland suffered a 3-0 whitewash at the hands of Afghanistan in the Twenty20 series between the sides after losing by 28 runs in India on Sunday. Afghanistan set a mammoth total of 233-8 off their 20 overs, Mohammad Nabi scoring 89 and Mohammad Shahzad 72. Kevin O'Brien was the pick of the Irish bowling attack with figures of 4-45. Ireland battled to a creditable 205 all out off 19.2 overs in reply, Gary Wilson hitting 59 and Paul Stirling 49, while Rashid Khan took 3-28. Ireland won the toss and chose to put their opponents, who had already secured the series victory, in to bat in Greater Noida. The Afghans scored at a stunning run rate of 11.65 per over, but an opening partnership of 65 off 26 balls between Stirling and Stuart Thompson got Ireland's response off to a promising start. Thompson smashed five sixes as he made 43 off just 18 balls. Despite a fine half-century by Wilson, the Irish wickets fell steadily thereafter however, Amir Hamza and Karim Janat providing support to Rashid Khan by taking two wickets apiece. "It was a fantastic game of cricket to have both teams score over 200, so credit to the ground staff and to how the teams played," said Ireland captain William Porterfield. "It's been a deserved series win for Afghanistan but there hasn't been that much between the teams really, just five balls either way in the games. "You cut down a few boundaries and you score a few more. You have to give it to them though as they've come hard at us and won the matches. "You know in these games it's going to come down to the last over or so. I was pleased with the way we kept coming and kept fighting to the end," added the Irish skipper. The sides will play five ODIs and an Intercontinental Cup game at the same venue.